Interior designers understand how colors affect our moods, feelings and emotions. As silent but powerful communication tools, lighting and colors can be creatively used to signal action, impact mood, and cause physiological reactions. Most often, the colors of a room’s wall are chosen to complement the ambiance of its area. 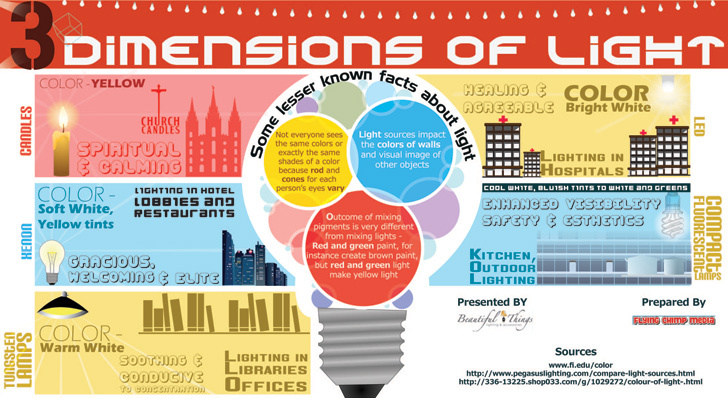 This infographic by Beautiful Things Lighting showcases the way that different light sources and colors can be used to create distinct environments. Click our gallery below to see a bigger pic!